CES 2011 is just a few weeks away, and we’re all assuming (and hoping) that Palm announces some awesome new devices to replace the aging hardware that’s out there right now. At this point, given the current marketshare numbers, what might be needed more than the new hardware is a new consumer mindset pertaining to Palm. According to the latest numbers from Nielsen, Palm’s marketshare stands at a paltry 1.3% in the United States, and we’d reason that international marketshare is around that, if not lower in countries where Palm products are even available. With Palm’s market penetration so low, the question weighting heavily on our minds right now is how do Palm and HP turn around their fortunes with webOS? The answer lies not with rebuilding marketshare. No, the answer is to reboot the public perception and start over. webOS is a fantastic operating system, but it was already fighting an uphill battle against iOS when it launched, and has since been eclipsed by Android and is facing competition for the bottom rung from, of all companies, Microsoft with their turn-the-smartphone-OS-on-its-ear Windows Phone 7. 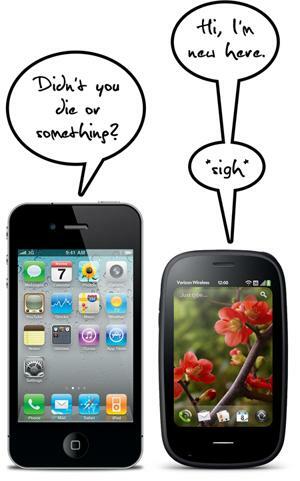 Many times I’ve sung the praises of Apple’s iPhone advertising. I may not like the phone (okay, I’ll admit, I get jealous sometimes... hardware, I swear), but I can appreciate Apple’s marketing mojo. The commercials are simple and straightforward. There’s no hyperbole about how the phone makes your life easier because it has live tiles, there’s no insinuation of easy multi-tasking by talking about a juggler, and there’s no whiz-bang graphics that never show an actual phone in actual action. iPhone commercials show you what the phone does and how you do it. It’s a phone and a finger, maybe two if they’re feeling frisky. So that’s rule number one to the consumer perception reboot: keep it simple. Rule number two is to be aggressive with consumers. This doesn’t just pertain to advertising, but also to product. I’m going to jump out of the smartphone market in this one and point at another company as an example: Ford. The Dearborn, Michigan, car and truck company was as just five years ago in the doldrums. Their products were languishing, sales were dropping, and there was a lack of decisive leadership. Ford brought on Boeing CEO Alan Mulally as the company’s new chief executive, and gave him the authority to do what was needed to turn the company around. In short order, Mulally revamped Ford’s product line, started shutting down or selling off assets that were dragging the company down (Aston Martin, Jaguar, Mercury, et al), and focused on improving the quality of Ford vehicles to rival that of the Japanese manufacturers that had taken the lion’s share of consumer good will. Most importantly, Mulally convinced the Ford board to leverage practically the entire company for a multi-billion dollar loan years before the financial collapse of 2008-2009 brought down GM and Chrysler. Ford used that money to revamp just about every model they built, as well as accelerating development in new high efficiency engines and their Microsoft-based Sync infotainment system. The aggressive development and new technology offerings in Ford vehicles have led to a swing in consumer sentiment, with Ford now gaining marketshare and selling vehicles at a consistently higher price than competitors due to pricey options like Sync. Palm doesn’t need to leverage the entire company. As you more than likely are aware, Palm now is owned by HP, and as I’m fond of saying, HP has giant bags of money. HP has been vocal in their support for webOS, saying often that they see the OS as pivotal to many of their future plans. But future plans don’t sell products. Nobody bought an Xbox 360 in anticipation of the eventual release of Kinect, and nobody’s going to buy a Palm product in anticipation of a future webOS update. Customers need a reason to buy your product over somebody else’s. Brand loyalty only goes so far. They need to be wowed, and there’s a lot in webOS that could do that. It needs to be emphasized, in the way that Apple (yep, going back there) used their advertising to show off just one iPhone feature at a time. There was no one commercial about FaceTime, apps, and the iPhone 4’s screen (jealousy). Future Palm devices need to so good that they make people forget that the Pre ever existed. But what’s awesome about webOS is not enough to get consumers to buy Palm phones. The Pre 2 is a solid phone, at least for those of us that are webOS fans. Its base specifications (processor speed, RAM, storage) may compare favorably to most other high-end smartphones, but there’s still something to be said for build quality, size, and design. Palm could add an 8MP auto-focus camera, gyroscope, compass, and a Retina-quality display and they’d still be catching up. The OS can “wow” all day long, but until people hold the phone in their hands and go “wow” over the hardware like they did over the original iPhone, HTC Evo 4G, and now the iPhone 4, they’re not going to be impressed. Future Palm devices need to so good that they make people forget that the Pre ever existed. Regla número tres: be aggressive with developers. I’m not advocating that you shake developers down for everything they’ve got, no, not that kind of aggressive. Developers need to be aggressively courted. The recent webOS Developer Day in New York City was a good start: developers got a preview of the new Enyo app framework, and everybody at the keynote got a free Pre 2. That’s great, but with only a handful of exceptions, everybody there was already a webOS developer. More developers need to be brought into the webOS fold. Numerous surveys have shown developer interest to be aimed primarily at iOS and Android. Shocking, I know. But BlackBerry and even Windows Phone 7 rank higher than supposedly easy-to-develop-for webOS. While the big three may have the advantage of a massive install base that draws in developers, Palm and Microsoft don’t have that advantage. Palm needs to take a page out of Microsoft’s Windows Phone 7 developer playbook and become an aggressive suitor. It’s one thing to have an easy to use SDK. It’s another to incentivize development. Microsoft hasn’t been bashful about their developer practices: they’ve paid developers handsomely to bring their apps to Windows Phone 7. It’s an aggressive pitch, and one that recognizes that today’s smartphone sales are in part driven due to the availability of apps. It would be wise of Palm to emulate Microsoft’s tactics here, and likewise not be bashful about it. Promotions like the Hot Apps competitions did some to incentivize development for webOS, but we can’t really say definitively whether or not the promotions brought in more developers. But aggression with regards to developers is needed. Offer to pay them for quality apps, throw in a free developer phone or two. Heck, give them an HP laptop with all the requisite webOS development tools and documentation preinstalled. Windows Phone 7 is already up over three thousand apps just weeks after its launch. It took the webOS App Catalog over a year to hit that mark. Bribing developers isn’t going to be enough: all the money in the world means nothing if the developers don’t have tools. Sure, there are developer phones and that set-up-for-developers laptop I just envisioned, but there are also the tools within the SDK that are needed so that developers can make the apps that sell. Those tools are APIs. I’ve been following webOS since its birth, so the API situation is not something that’s new to me. But if I were new to webOS, I’d be stunned that a modern smartphone platform that’s a year and a half old still doesn’t allow developers to access the microphone or camera, read the calendar database, or any of the other hundred little things that make for great apps iOS and Android. I’m not saying that webOS doesn’t have great apps (it does, clearly), but I certainly can’t hold my phone up to the music and find out what’s playing. Developers, like everybody else who does anything, are in it for two reasons. One: they enjoy doing what they do. Two: they can make money doing it. In the end, it comes down to money; the last thing you want supporting your app store a mass of hobbyist developers. Don’t get me wrong, the hobbyist developer is a vital component of any thriving app store, but it takes the big name developers with the big bucks to make the apps that make the platform. The key is to break the cycle and either get a few million phones into the hands of users, or give the developers reason to make for your platform. You could cite the old cyclical problem of developers want users to exist before they’ll invest in making apps, but the potential user wants the apps before they’ll buy the phone. The key is to break the cycle and either get a few million phones into the hands of users, or give the developers reason to make for your platform. With the right tools and incentives, developers will have reason to develop for webOS without the userbase needed to pay for the development cost, and then the users will come, having seen the available apps. Now that I’ve covered the customer and the developer, there’s another chink in the webOS armor that needs to be patched. Well, not patched, but corrected in this replacement armor. The problem is availability. It’s not that you couldn’t walk into the store of a carrier that sells one of the three varieties of Palm Pre phone and pick one up. The problem is that there aren’t that many carrier that sell the phone. The iPhone’s success has been driven by two factors. Firstly, it as the touchscreen iPod phone everybody already wanted. But it was the second generation that made for beyond blockbuster sales: the iPhone 3G was everywhere. Palm doesn’t have the luxury of consumer demand for a specific product. What they can do is get webOS onto more carriers. Of course, that’ll require the impressive phone, but it will also require that the case be made to carriers that these phones will make them money over the long haul of the customer’s contract. That means helping the carriers build support for additional pay services (like GPS navigation or streaming television). The flip side of the coin is that Palm cannot allow themselves to be beholden to the carrier. Verizon’s GPS issues are clear evidence of the carrier’s tinkering with webOS, to the point of ruining the customer experience unless they pay extra for an additional service. It’s not the fault of conflicting APIs or some bug, it’s intentional crippling, and manufacturers like Palm need to stand up to that. If the carrier is in discussions with you to get your phone on their network, then they clearly want it. Bargain elsewhere to make that kind of nonsense go away, argue that crippling the phone will in the end drive away the customers that putting the phone on their network are supposed to bring in. Whatever you do, don't let it happen. Either way, the relaunch of webOS needs to happen everywhere. Palm phones should be available on multiple networks in every country across the globe. Samsung has proven that without carrier exclusives it’s still possible to sell millions of devices in a short span, so long as the device is of sufficient caliber to draw customers. The availability of the iPhone on multiple carriers in Europe, Australia, and Japan has led to Apple’s smartphone dominating those smartphone markets I’m not talking a simple plurality of users, no, according to the last AdMob report, the iPhone holds a commanding 73% of the smartphone market in Western Europe, and a stunning 91% in Oceania. The relaunch of webOS needs not only to be spectacular in terms of hardware. It needs to be spectacular in terms of scale. Everything needs to come together in massive scale: the new devices need to be available everywhere, they need to be awesome, and they need to have brilliant apps galore. It’s clichéd, but when Palm comes out to reboot the webOS perception, they need to go big or go home. Going big leads to my last point, rule number five: be arrogant. Being the quirky little phone maker that acts like an spunky little startup isn’t going to sell phones in the quantities needed to make webOS a success. Palm needs to start acting big, and with the weight of HP behind them they now have reason to do so. Everything needs to happen like clockwork, because that’s how things happen when you’re big. That means that everything needs to go bigger. Product launches need to happen with flair and pizzazz, advertising campaigns need to hit the television, internet, radio, bus stops, and - of great importance - the carrier store. Everything needs to happen like clockwork, because that’s how things happen when you’re big. Products announced become products shipped. Things like Mojo Messaging Service can’t be left to languish, announcements like Exhibition can’t not make the cut when you ship the product. Now don’t take my advice of being arrogant to mean that you’re to act as if you’re without fault. Apple may be selling the iPhone 4 by the barge-full, but that doesn’t mean that the whole “Antennagate” brouhaha didn’t deal a blow to their public face. Take a lesson on the need for humility when mistakes are made: own up to them and fix them quickly. In the day of the internet, attempting to bury a story only makes it worse. Rebooting the consumer perception of webOS starts with rebooting Palm’s perception of itself. Palm needs to become aggressive and will to throw their weight around. Sometimes throwing a few jabs means you open yourself up to getting smacked. But going on the offensive is far better than running around the ring for nine rounds, hoping that your opponent doesn’t catch on to what you’re doing, adapt, and take you down for good. Palm came out swinging in round one, but was hit hard from the start. Round two was a disappointment, with Palm struggling to land a punch even near the opponent. Round three, well, we’re not sure if round three has started yet, or if we’re still waiting, because Palm’s still sitting on their stool in the corner, with the trainer tending to wounds and replacing already worn out gloves. When the next round begins, Palm needs to come out swinging like never before. The punches need to be more powerful, the showmanship needs to get the crowd into the game, and the opponent needs to be sent back to his corner with a bloody nose and stars in his eyes. But before that, there needs to be the reset, the quiet period during which Palm collects itself, adjusts to the new overlords at HP, and gets down to business like never before. If that means we don’t hear much for a while, that’s fine. The consumer has all but written off Palm anyway and HP can afford for the company to not sell a single phone for a year or more if that’s what it takes. Obviously, I don’t want it to take that long. I want Palm to surprise us all at CES with a raft of new smartphones and tablets and an update to webOS that brings it in line with iOS 4.2 and Android 2.3. I want the reset to happen today, but I know it won’t. But when the reset does come, it better be big; if it isn’t I fear I’ll be writing the post mortem eighteen months later instead of another rant like this.